I was doing a Google search (don't ask for what) when I came across the picture above. I thought it was a pretty funny Hello-Kitty-pink photoshop job so I did a search for the title of the comic book just to make sure it was fake. Here's the publisher's summary from Wookiepedia. She's a Princess with a fiery spirit and a hot temper to match. He's a scoundrel with a mercenary's sensibility and the heart of a hero. Together they help topple an Empire and restore order to the galaxy…And if they stop fighting long enough, they just might realize that they're in love! Set during the days leading up to The Empire Strikes Back, Han Solo and Princess Leia find themselves trapped together on a downed starship, lost in the frozen wastelands of Hoth as a storm rages around them. And while the snow flies outside the ship, the sparks fly inside. No matter how hard they fight it, there's more going on between them than just friendship! 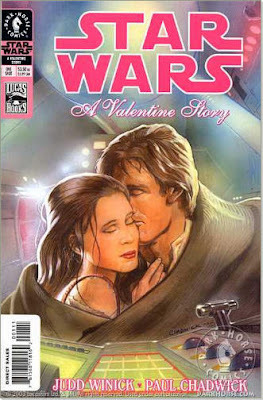 I can only hope that the last frame of the comic is "Han shot first."